Cain Has Long Ties To Koch Brothers-Linked Group Americans for Prosperity first enlisted the Republican presidential candidate in 2005 to spearhead what it called the Prosperity Expansion Project. Herman Cain met his future campaign manager, his first press secretary and the architect of his 9-9-9 tax plan while working with the organization. Explore the latest NPR coverage of GOP presidential candidate Herman Cain. 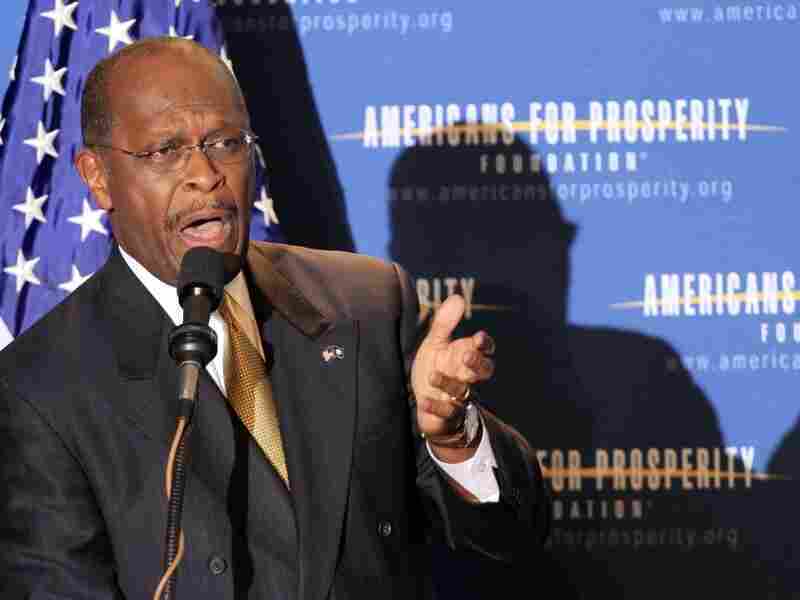 Republican presidential candidate Herman Cain speaks at a dinner in April sponsored by Americans for Prosperity in Manchester, N.H. Cain has close ties to the group, founded by billionaire businessmen David and Charles Koch. Republican Herman Cain, facing allegations of sexual harassment, returns Friday to a familiar, and presumably friendly, venue — the annual convention of Americans for Prosperity, the conservative group founded by billionaire businessmen David and Charles Koch. The group has a long relationship with Cain. The organization first enlisted him in 2005 to spearhead what it called the Prosperity Expansion Project. Cain went on the road, networking at state chapters of AFP. When he landed in Wisconsin, he met his campaign-manager-to-be, Mark Block. Block was Wisconsin coordinator for AFP, for which he went to work as he was coming off three years of being legally banned from Wisconsin politics. The ban was part of a settlement signed after he was accused of illegally coordinating an attack strategy between a candidate's campaign and an outside group. That case bears some resemblance to a more recent one. Documents reported on by the Milwaukee Journal Sentinel seem to show that Block bankrolled the early days of the Cain campaign with anonymous money from an outside group. "At the time, AFP needed somebody who knew Wisconsin," said Jeff Mayers, president of Wispolitics.com, a political news service in Wisconsin. As for Block: "For a guy who was out of politics and looking to get back into politics, that was probably a pretty good job," Mayers said. Cain's first press secretary also came from AFP. And Rich Lowrie, the architect of Cain's 9-9-9 tax plan, was on AFP's advisory board when Cain was giving speeches for the organization. On Fox News last month, Lowrie said he and Cain started formulating a tax policy years ago. "A year before Mr. Cain announced, I got a call from Mr. Block saying, 'You're not going to believe this, but Mr. Cain is going to run for president and I'm going to be his chief of staff,' " he said. Cain's connections to the Koch brothers themselves are also important. "I know the Koch brothers," Cain said in a CNN interview last month. "I don't have a close relationship, but I know them and respect them, and they know me and respect me." Although Koch Industries hasn't formally committed to any of the Republican presidential candidates, in a statement last month, Executive Vice President Richard Fink said: "Anyone that has spent time with Mr. Cain, as we have, can tell you he is a man of deep dedication to our nation." Cain's ties to the Kochs and their group had a practical benefit for his fledgling campaign: Aspiring presidential candidates usually have built their own networks — a consultant here, a mentor there. Cain found much of what he needed in one place, AFP. "What may be changing now is that groups are becoming much better organized around electoral politics," said David Primo, a professor of political science and business administration at the University of Rochester. That is, groups like Americans for Prosperity, with a central office, a big grass-roots base and solid financing, which can provide a candidate with one-stop shopping. "So you can see this kind of emergence of a candidate in a way that you hadn't in the past," Primo said. So it means that, in many ways, Cain's return to AFP this week is a well-timed homecoming.